The North Eastern Railway (NER) Class S1 (LNER B14) was the second of Wilson Worsdell's 4-6-0 designs. The first of his 4-6-0 designs, the NER Class S (LNER B13), was a disappointment when compared with the contemporary but smaller NER Class R (LNER D20). Although disappointing, the B13 was good enough to prove the worth of using a 4-6-0 design for passenger services, and the B14 attempted to deliver the promise of this larger design. A total of five B14s were built between 1900 and 1901 at Gateshead. Although their performance was an improvement over the B13s, it was not sufficient for further batches to be built. Schmidt superheaters were fitted between 1913 and 1917, when the boilers came up for renewal. Superheating was the only significant change made to the B14s, and had the effect of lengthening the smokebox to create a more pleasing appearance. The B14s were build with Ramsbottom safety valves, but Nos. 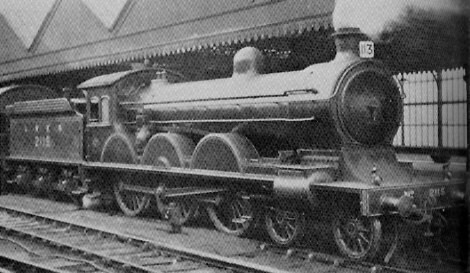 2112 and 2115 had Ross pop valves fitted by the LNER. When built, the B14s were allocated the heaviest passenger expresses between York, Newcastle, and Edinburgh. They were gradually replaced by D20 (NER R) and D21 (NER R1) 4-4-0s on these top services. From 1907, the B14s were mainly allocated to main line goods traffic, especially the Scottish fish trains. In late 1924, the B14s were allocated to Hull Botanic Gardens. Unpopular at Botanic Gardens, the B14s moved to Dairycoates in 1925. By this time, they were being used on moderately sized freight trains and braked fish services. In the late 1920s, they occasionally hauled extra passenger services to Bridlington. The locomotives required a second boiler replacement between 1929 and 1931. A significant decline in traffic due to the Depression was already occurring, so the decision was made to withdraw the B14s rather than build new boilers. All five engines were withdrawn between 1929 and 1931. Heating Surface: Total: 1750 sq.ft. The last B14 was scrapped in 1931, and none of the B14s survived into preservation. I am not aware of any models of the B14s in any scale.